The Grand Sirenis Mayan Beach is situated on the Mayan Rivera, just 20 miles from Playa del Carmen, and 1 hour from the airport at Cancun. The property has several Mayan Ruins, huge “cenotes” and 2 natural wonders, together with 5 beaches up to 3.000 ft extension, making their location one of the best on the entire Mayan Riviera. This property has several Mayan Ruins, huge "cenotes" and 2 natural wonders together with 2 beaches, making their location one of the best locations in the Mayan Riviera. Spacious public areas, indoor and outdoor lounges, air-conditioned buffet restaurant, 8 a la carte air conditioned restaurants. The Grand Sirenis is one resort you will never want to leave! 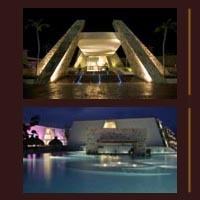 This website is in no way associated or affiliated with GRAND SIRENIS HOTELS & RESORTS.